On the eve of the violent military coup against Salvador Allende on 11 September 1973, Chile found itself in unprecedented economic chaos. Shaken by hyperinflation, widespread shortages, and labour unrest, the “Chilean road to socialism” might have been doomed by simple economic collapse, even if the coup had never taken place. But for many people it’s an article of faith that the United States was deeply responsible for the destabilisation of the Chilean economy. In that narrative, the Nixon administration had imposed an “invisible blockade” against Chile, a multi-front economic war conducted by an alarmed imperial hegemon bent on aborting the first democratic socialist experiment in Latin America. But was the “invisible blockade” actually successful? Did it cause, or contribute substantially to, Chile’s shambles in 1972-73? This narrower question of the actual economic impact of the ‘blockade’ has gotten lost in the shuffle of the larger question of US culpability in Pinochet’s coup. In this post, I argue, regardless of whether the “blockade” was as extensive or as maliciously intended as its maximalist critics allege, it did not make any difference. The controversy about the US involvement in Chile peaked in the 1970s immediately following the coup and in the wake of the Church committee hearings in the US Senate. But it has periodically flared up in tandem with coup anniversaries, the arrest of Pinochet in London, his prosecution in Chile, his death in 2006, etc. At the same time, there’s been a steady stream of books and articles dealing with US interference in Chile which mention the ‘blockade’ mostly in passing. Yet these usually assume as a matter of course that it must have ‘worked’. For example, Peter Kornbluh’s The Pinochet File, now in its second printing (2013), combines a narrative of Yankee shenanigans with fascimiles of declassified US government documents relating to Chile. Amongst those are Richard Nixon’s hand-written instruction to the CIA to “make the [Chilean] economy scream“; or Henry Kissinger’s infamous National Security Memorandum 93, calling for economic and financial measures against Chile. The steps outlined in that memo bear close resemblance to what the United States actually did. Farnsworth et al., Facing the Blockade (1973) (Spanish translation in PDF). Paul Sigmund, “The Invisible Blockade and the Overthrow of Allende” (1974) (Spanish translation in PDF). Exchange between Farnsworth and Sigmund in Foreign Policy (1974). Farnsworth et al. “The invisible blockade: the United States reacts” in Chile: Politics and Society (1976), pp 338-373. Sandro Sideri, ed., Chile 1970-73: Economic Development and its Interational Setting (1979). pp 200-241, Mark Falcoff, Modern Chile, 1970-1989: A Critical History (1989). Except for the Sideri volume, this ‘blockade’ literature is about financial politics and diplomacy, not economics. They dwell on (a) the motivations of the US government, various private banks and corporations, the multilateral financial institutions, etc. ; and (b) the minutiae of Chile’s external financial relations in the years 1970-73, such as the Paris Club negotiations over the country’s external debt, World Bank deliberations, legal proceedings related to copper, etc. US foreign aid to Chile fell dramatically in the Allende years. This included long-term development loans (USAID), trade finance (Eximbank), etc. During Allende’s tenure, no new loans were originated by the World Bank, and the amount of loans from the Inter-American Development Bank fell dramatically. Chile had been a major beneficiary of both institutions before 1971. At the end of 1971, the Allende government announced a moratorium on the servicing of foreign debt (mostly owed to US banks). There was a gradual reduction, not a total elimination, of lines of credit from US private banks which normally financed Chile’s imports on a short-term basis. There was no embargo on trade, but Chile had to pay for imports in cash upfront, in proportion to the loss of trade finance. The Allende government completed the nationalisation of the copper mining companies initiated by the previous administration (Frei), but decided not to compensate the mostly U.S. owners. US copper companies attempted in various jurisdictions, including France, to attach Chilean copper shipments, but this met with only partial success. Chile was able to obtain aid and credit from alternative sources in Western Europe and Latin America, as well as the socialist bloc. Sigmund and Falcoff, who might be called ‘anti-blockadists’, argue there was no blockade because there wasn’t a total cut-off in aid and credit. And the “credit squeeze” by private banks was not politically motivated, but largely a legitimate financial response to Chile’s deteriorating credit-worthiness. They also argue alternative sources of aid and credit went a long way in compensating for the loss of traditional sources. The ‘blockadists’ Farnsworth and Petras stress that before Allende, Chile had always relied on external aid and credit to cover balance of payments shortfalls arising from the volatility in the price of its main export, copper. They also argue — reasonably — that numbers alone don’t tell the whole story, because the scarcity of short-term credit restricted Chile’s ability to obtain from the United States spare parts for critical industries. Much of Chile’s equipment stock was US-made and required American parts. The Allende government’s budget deficit (fourth-to-last line, “overall surplus”) was 15%, 25%, and 30% of GDP in the years 1971-73. That’s massive! Greece at its worst in 2009 hit 15% of GDP. If the United States had budget deficits equal to 30% of GDP, that would amount to $5 trillion — more than three times the actual US budget deficit at its nominal peak in 2009. But more importantly, the last line (“net internal financing”) shows that the Allende government cranked up the printing press. Almost the entire budget deficit was financed by money creation. 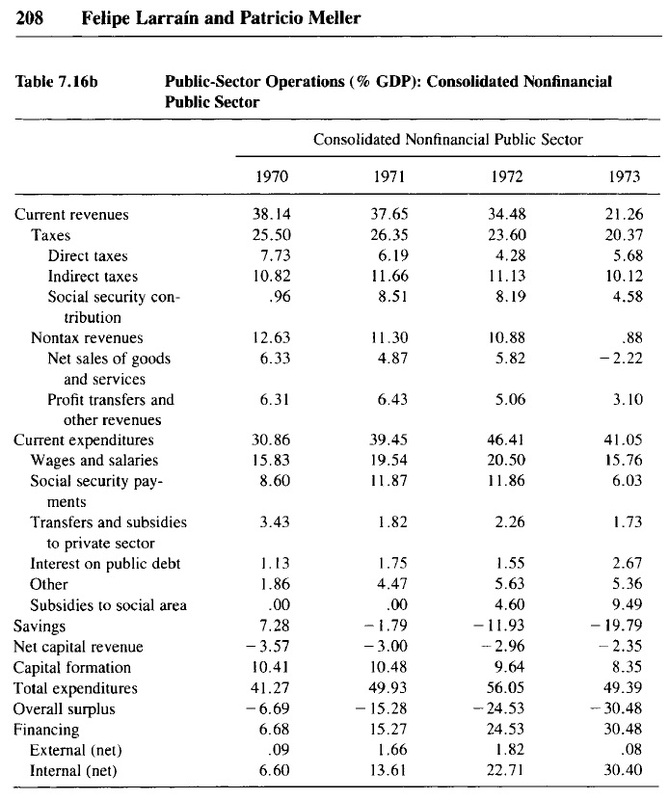 The largest single factor in the deterioration of public finances as of 1971 was clearly the higher spending on wages and benefits. This was a deliberate part of the populist programme of the Allende government to achieve income redistribution by raising nominal wages while freezing or even reducing menu prices. By the end of 1972, however, inflation was eating into tax revenue in real terms (i.e., the Olivera-Tanzi effect). And the international price of copper, Chile’s main source of foreign exchange earnings, was 25% lower in 1971-72 than in 1970, until it recovered in 1973. [Bosworth et al., Table 1-1, pp 32-33.] Combined, these two effects eventually cost the Chilean treasury about as much as the increased spending on wages and benefits. For me, this is quite sufficient as an explanation for the catastrophe of Chile in August 1973. Expenditure on wages, benefits, and industrial subsidies, combined with the falling price of copper and the inflationary erosion of real tax proceeds, explain nearly all of the 30% of GDP deficit by 1973. How do you produce such a situation through external intervention ??? Did the CIA install printing presses in the Andes and haul sacks of money by llama to the cities of Chile? What about those spare parts that Chile had difficulty importing because of insufficient trade finance? Surely that must have affected industrial production, contributing to the shortages; and affected government revenue via lower output in mining ? Every ‘blockadist’ author emphasises this. And there would be feedback effects: lower output –> lower revenue –> more inflationary finance –> etc. It’s more plausible that the mining sector, whose output was declining as early as 1972, suffered from a shortage of spare parts. But without micro-level data on spare parts imports and industry usage, this question can’t be answered. [Both tables 5.3 and 6.10 from Falcoff p. 137-9 and 192-3, respectively] The nation-wide wave of strikes in the summer of 1973 demanding the indexation of wages to inflation was initiated in sympathy with copper miners who walked out for over 74 days and even clashed with police. It’s difficult to see how this state of affairs can be blamed on external factors. Either hyperinflation was eroding real wages despite large nominal wage increases, or the political ascendancy of the left was raising worker expectations. Socialist and communist labour unions were part of Allende’s Popular Unity coalition, but they often had little control over the workers. Of course none of this helped the real economy: strikes by miners alone is estimated to have cost about 7-8% of copper export earnings. I think most readers of this blog know how the balance of payments works, but just in case: a current account deficit must be covered by inflows of hard currency, e.g., foreign loans, or foreign charity, or flows of investment capital into the country. If total inflows are insufficient, then the balance of payments deficit must be met out of reserves at the central bank. The last line in Table 1.13 is equivalent to a draw-down of reserves. In one year, 1972, the higher food import bill was clearly met partly by importing fewer capital and intermediate goods, a category which includes spare parts. So if the “credit squeeze” did anything, it was to force upon Chile a choice between paying cash upfront for those goods and paying cash upfront for the extra food. The Allende government understandably chose the latter. Had Chile not been obliged to import so much extra food as a result of its own disorderly land reform, then it would not have had any difficulty on the spare parts front even with the falling price of copper. As far as I know, no one has ever before made the connection between Allende’s agrarian programme and the country’s difficulties in importing capital & intermediate goods. …Chile had faced dramatic downswings in the price of copper before in her history; since the mid-1950’s the United States had usually poured in aid to offset losses from low copper prices. The central point to understand in looking at the economic situation in Chile in 1972-1973 is that the low price of copper, the credit blockade, and the concomitant capital outflow wiped away Chile’s dollar reserves without Chile’s having any recourse to loans or aid to compensate for the loss. The Unidad Popular never expected all U.S. private bank loans to be called in, nor that the IDB and the World Bank would grant no new loans. In order for the Unidad Popular’s economic strategy to work, Chile needed some sources of credit in the United States to keep imports fairly constant. It is true Chile had to live off reserves more in 1971-3 than in 1960-70, and this depletion of reserves was obviously unsustainable. 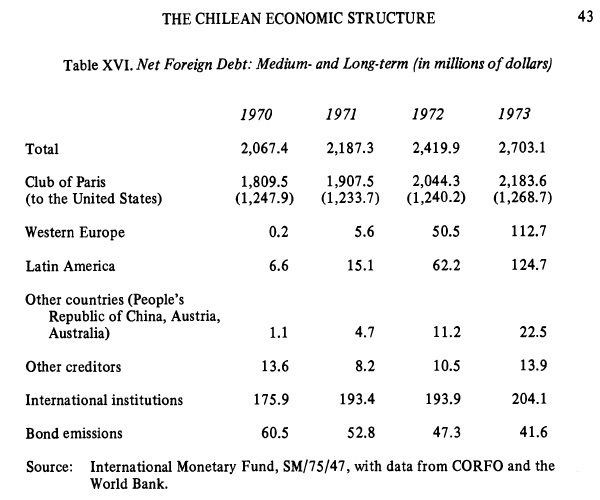 So on the eve of the coup in September 1973, Chile was well on its way to a balance of payments crisis. But it had not had one yet. Chile throughout the Allende years was able to make ends meet. Moreover, Chile was able to obtain new credit facilities from Western Europe and Latin America, even though the credits were often tied to the purchase of imports from the creditor countries. This forced Chile to reorientate its trade away from the United States and toward Europe, Latin America, and the socialist bloc. This is why Chile’s external debt actually rose from ~$2 billion in 1970 to ~2.7 billion in 1973. The “invisible blockade” does not make much sense as a story. From a bird’s-eye macroeconomic perspective, any supply shock relating to spare parts would have been at best a drop in the bucket. From a terms-of-trade perspective, it was the need for more food along with the falling price of copper which caused the Allende government to ration its own foreign exchange in favour of food. From a purely balance of payments perspective, the moratorium on foreign debt service mostly made up for the loss of capital inflows that had been previously made available by the United States, multilateral institutions, and private banks in the 1960s. Despite all this, Chile still dipped into reserves. Addendum: I recently wrote a short post on post-Allende Chile. I think Chile in general, but Pinochet’s economic reforms especially, is kind of overrated. This entry was posted in Chile, Political Economy and tagged Allende, Bloqueo invisible, Chile, Invisible Blockade. Bookmark the permalink. 14 Responses to Did the “Invisible Blockade” against Allende’s Chile work? Well, the solution to that problem is for the U.S. to become a socialist republic. Then it would be internationalist solidarity rather than imperialist charity. Great post. The Chilean coup has become part of the whole “Revolution That Failed” complex you see among the Jacobin leftist set, with the Good Allende being toppled by the Bad Old US. Turns out, though, he was just incompetent and the Chilean macroeconomy was run terribly during his presidency. Another way of saying this would be that the invisible blockade failed, and the price of copper was clearly not going to remain at those artificially depressed levels, so a coup was deemed necessary. Pinochet never gave back the mines, which still underwrite the government and liberal spending in the Chilean public sector. Actually my original title was going to be “Wait, but didn’t the Invisible Blockade fail ???”. What do you mean copper prices were “artificially depressed” ? They started rising again some time in 1973 if I recall correctly, and the rising prices helped the Pinochet regime. But commodities go through short- and medium-term cycles (although over the very very long run they have a downward trend). Yes, there’s always been consensus that the mines should be nationally owned, and of course a part of the nationalisation process (50% of the copper assets) was initiated before Allende. And, yes, Chile is still highly dependent on copper — which in my opinion shows what an overrated country it is generally — regardless of the regime type (pre-Allende, Allende, Pinochet, post-Pinochet). Because the coup had nothing to do with Allende’s decision to use tear gas on the wives of the military officers, leading to almost unanimous antipathy to Allende in the military? On the one hand you seem to want to argue that Pinochet and the Chilean military were mere stooges of the US imperialists, who followed marching orders for Washington to overthrow their own government. And on the other hand you seem to want to argue that Pinochet thwarted the primary aims of those imperialists. Or, yet another way of interpreting this data is that the US had relatively limited leverage over Chilean internal politics, and regardless of its aims had little ability to sway Chilean politics. Consequently – and logically and exactly as you might expect if you aren’t some sort of racist – the coup against Allende was largely planned and motivated by Chilean citizens who had their own motives for doing what they did, and were largely reacting not to US “imperial” pressures but the actions and decisions of other Chilean citizens, and the whole narrative about Caucasians masterminds in Washington manipulating the brown skinned simpletons pushed by the left, is just a bunch of racist BS propaganda offered up in defiance of the facts rather than as a result of considered examination of them. This is a very strange comment. Did you actually read what I wrote? I do not say or imply that the coup was cooked up in Washington! To the contrary, my point is that Allende, not the USA, created the conditions which set the stage for the coup !!! As for the US involvement in the 1973 coup, there’s still not that much evidence of a direct involvement, although that the USA was involved in the attempted 1970 coup is well documented. But whatever its involvement, the USA could never have just magically conjured up a coup even if it had tried ! The coup was indigenous. We agree yet you have somehow hallucinated that we disagree ! Apparently he’s saying I’m the racist propagandist.